The first look of Rajini’s next with A.R.Murugadoss released on the 9th of April, and social media has been set ablaze. The movie is titled ‘Darbar’, and Rajinikanth plays a cop in it. The excitement has reached new heights for this biggie. The shooting of this movie had begun officially yesterday (10th April) in Mumbai, with a pooja. Meanwhile, a video of A.R.Murugadoss’ fanboy moment with Thalaivar is going viral in social media. 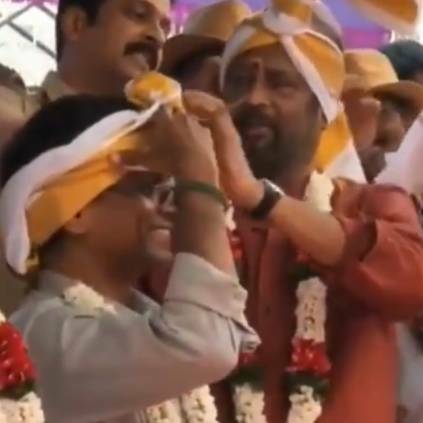 Rajinikanth, Subaskaran and Murugadoss were standing together during the pooja, and Rajini casually adjusted Murugadoss’ turban. A.R.Murugadoss was spotted smiling with joy when Rajini adjusted the silk turban, and his reaction is priceless. ‘Darbar’ stars Rajini and Nayanthara in lead roles. It has music by Anirudh Ravichander and cinematography by Santosh Sivan. The project is bankrolled by N.Subaskaran under his banner Lyca Productions. The movie is scheduled for a Pongal release next year. Stay tuned. People looking for online information on A.R.Murugadoss, Darbar, Rajinikanth, Thalaivar 167 will find this news story useful.